This was our second instalment in a long-distance walk following the Somerset Coast Path , from Bristol, south and then west to the North Devon border at Lynmouth. 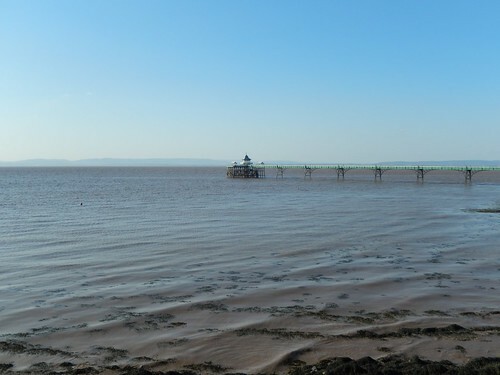 As there is no actual coastal route between Clevedon and Weston-super-Mare, this is a troublesome stretch for many and, having both read the accounts of other bloggers and coastal walkers passing through here; we were lacking in optimism for what obstructions and obtrusions may lie in wait ahead of us. 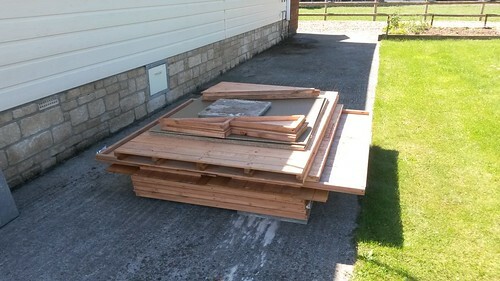 On Thursday, I took an afternoon off work to receive delivery of an 8ft x 6ft tongue-and-groove shed. This’ll be used for self-storage of items that are currently cluttering my home so, I’m more than happy to spend an initial outlay, as opposed to endlessly paying monthly rental fees at a large warehouse chain. I’m fortunate enough to have been granted a space away from my own home on which to erect this small garden building. 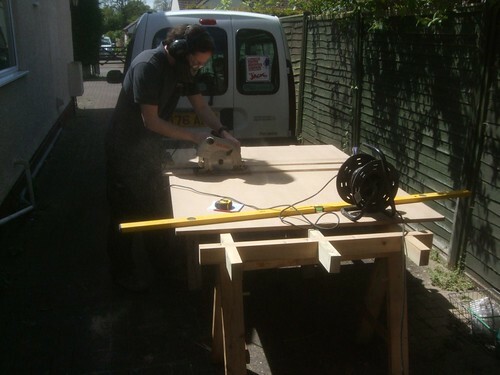 In this post, I’ll document the process of building a sturdy sub-base for the shed to sit on. I’ll emphasise now that this was designed with the word temporary in mind (there’s every chance it could have to move in a couple of years). If you plan on building a base for your decking, you may also find this very interesting. With the summer fast approaching, I frequently think back to last July, when I walked along a stretch of the Jurassic Coast further south in Dorset. 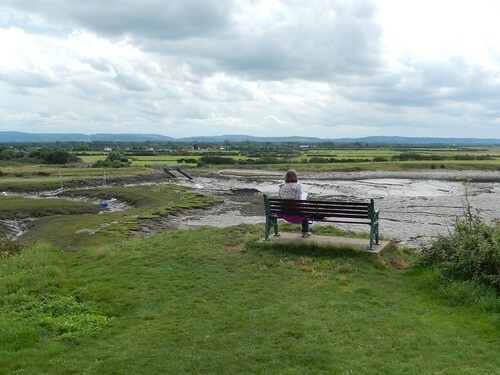 I have plans to do a little more coastal walking this year (along with further camping expeditions) and as somewhat of a ‘warm-up’, I met up with a friend in Clevedon (a local town for me) and we set off on a linear route towards Portishead. 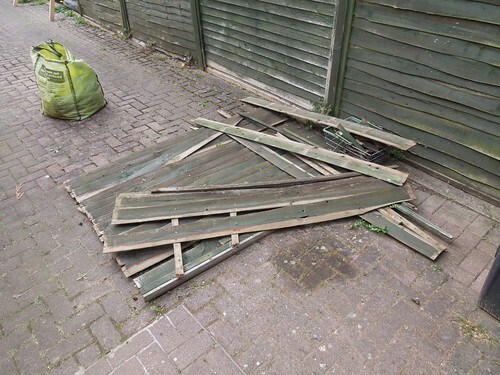 With a long weekend and clear skies forecast, I decided I would use this time to try and replace the fence panels that blew down sometime in, erm… February! That’s without mentioning the two fence posts that had each rotted away at ground level. It had seemed like a monstrous job; the kind that I detest, with my general hatred towards pathetic fence panel construction. Each morning I’ve driven to work, each evening I’ve come home; that gaping view on to the neighbour’s weathered decking had been haunting me for far too long. I was tired of tripping over the old panel remains just outside the workshop door. Something had to be done! It’s been a while since I’ve been able to say that I was out in the workshop last night until darkness fell and, that’s one of the small things I missed most while I was living away from home. Last night, I was out there until 21.30, making early progress on the folding laptop desk I’ve been wanting to build for a while now. 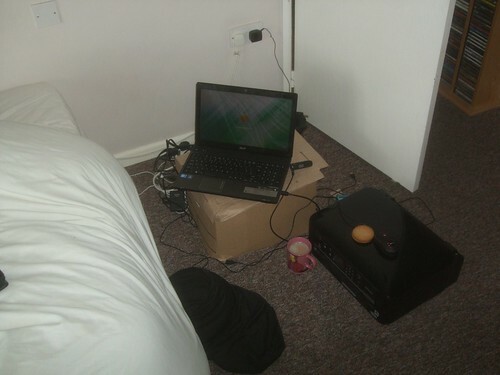 You see, I’ve spent the past two weeks (since moving back home) using my laptop in such a manner. It’s far from comfortable and, not matter how I sit, resting in one position on the floor for too long leaves me with either a dead leg or pins and needles! I was hoping to have my router table build underway by now. At lunchtime earlier, as soon as I finished work for the week; I popped in to the nearby timber merchant to collect a sheet of 18mm MDF. I almost couldn’t believe it when I was told that they were out of stock! I guess it’s just another reminder that procrastination doesn’t pay… Had I gone to buy this sheet a week ago (regardless of the weekend’s weather forecast), it probably would’ve been in stock and I could’ve made a start today, if not sooner. Well, at least I do now have the rest of my order from Axminster, including the Kreg pocket-hole screws that I’ll be using to assemble the new table. I’ve decided to go with ‘regular’ MDF for this (not MR moisture resistant), as it’ll only live and be abused within the workshop (not sitting in direct contact with a damp wall or floor) and the painted finish should also offer some protection. It will remain 800mm wide on top but, I’m increasing the depth to 560mm. It may sound like an odd size but, I really couldn’t decide between 500mm and 600mm so, I decided to (try and) go halfway way! Also, the height’s been increased slightly to 960mm, which is about 30mm higher than my 16in bandsaw, which has often felt a bit low. This also provides a little extra clearance for my router, measuring vertically. I’m hoping to collect it tomorrow morning, if I can drag myself out of bed. Today, I have been playing with getting the aluminium insert plate ready and I hope to have some photos for you over the weekend.